FILE - Egyptian women hold banners during a protest against sexual harassment in Cairo, Egypt, June 14, 2014. It might have been another #MeToo moment: An Egyptian woman says a man stalked her at a bus stop, made inappropriate advances, and only backed off when she began filming him with her cellphone. But when she posted the video on Facebook, it ignited an online debate in which many Egyptians, including women, took the man's side. Some say he was politely flirting and the woman overreacted, while others have speculated about what she was wearing, suggesting she was the one at fault. Sexual harassment, mostly ranging from catcalls to occasional pinching or grabbing, is rampant in Egypt. Polls have found that a majority of both men and women in the conservative Muslim country believe it is justified if women dress "provocatively" in public. 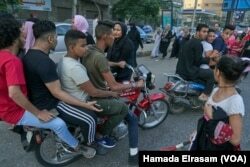 FILE - A young girl reacts to harassment from a group of young men on motor bikes during Eid Al-Fitr in Cairo, Egypt, June 15, 2018. That may explain the response to the brief video Menna Gubran posted on Aug. 15. In it, a man later identified as Mahmoud Soliman can be seen approaching her on a suburban Cairo street and inviting her to coffee at On the Run, a nearby convenience store. She politely declines, and he apologizes and walks away. In a subsequent video and in TV interviews, Gubran said Soliman had circled in his car three times as she waited for a bus and made comments that made her feel uncomfortable. At one point, she went into a nearby supermarket, hoping he would leave. When she returned, he came by again and got out of his car, at which point she says she began filming. Soliman, who has also given TV interviews, denies doing anything wrong and disputed her account of circling in his car. "I just invited her to drink coffee, and I never bothered her. When she said I was bothering her, I apologized and left," he said. "The man was speaking in a very polite and respectful way and she as any Egyptian woman called him a harasser," a man who identified himself as Mustafa el-Sokarri wrote on Twitter. Others asked what Gubran, who does not appear in the video, was wearing, with some fishing personal photos out of her social media accounts. Many treated the incident as a joke. The Arabic phrase for "Let's drink coffee" trended on social media, and "On the Run Guy" even enjoyed a moment of local fame. "The incident was indeed harassment and a violation of the girl's privacy," said Maha Ahmed, a human rights lawyer at the Egyptian Commission for Rights and Freedoms. "Unfortunately, there is misunderstanding of harassment in Egypt and this caused the controversy." 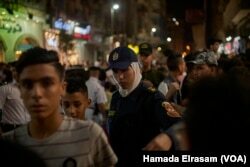 FILE - Policewomen show up on duty at movie theaters to organize crowds and protect girls from possible sexual harassment in downtown Cairo, Egypt, June 15, 2018. The problem of sexual harassment in Egypt gained worldwide attention during and after the 2011 uprising that toppled President Hosni Mubarak, when women were harassed, groped — and in some cases, beaten and sexually assaulted — during mass protests. Mozn Hassan, a women's rights activist, said that although the law was a positive step, it does not define different kinds of sexual harassment. "The state should lay down a clear definition," she told the daily al-Shorouk on Sunday. A study released last year by Reuters ranked Cairo as the most dangerous megacity in the world for women. President Abdel-Fattah el-Sissi questioned its findings, but acknowledged in TV comments last November that "there is sexual harassment in Egypt. There is a big percentage, but not to say it is the worst." Another poll carried out last year by U.N. Women and Promundo, a nongovernmental organization, found that nearly 60 percent of Egyptian women say they have been sexually harassed, and nearly 65 percent of men acknowledge harassing women, though they mainly admitted to ogling. The poll, which surveyed 1,380 men and 1,402 women in five governorates, found that 74 percent of men — and 84 percent of women — agreed that "women who dress provocatively deserve to be harassed." Forty-three percent of men said women "like the attention" when men harass them.